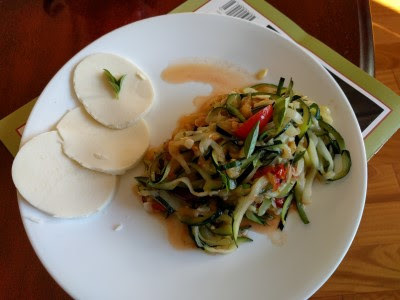 When we bought a spiralizer back in March/April, one of the reasons was to liven up our summer zucchini dishes. We had been growing weary of sliced and grilled zucchini. Of course this year it seems our garden has not produced as much zucchini as it has in the past and we haven't been to the farmers market as much as usual. So we have not eaten much zucchini. Then I realized it was the end of August and we had not spiralized a single zucchini all summer long. Back in the spring, yes. But this summer? Nope. So I decided we needed to fix that. Around the same time, Epicurious tweeted/emailed a recipe for Zucchini Noodles with Eggplant & Tomatoes. Eggplant? We haven't had eggplant in ages either. So that's what we made. Our cooked eggplant became mushy and ended up disappearing into the dish, but the flavor is still there. Three zucchini, spiralized. 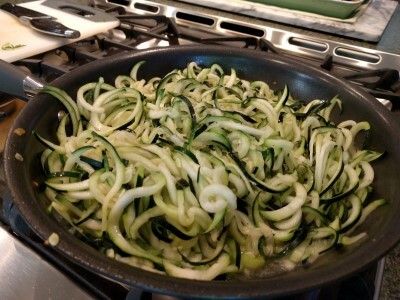 We sauteed our zucchini spirals for a bit even though the recipe doesn't call for it. 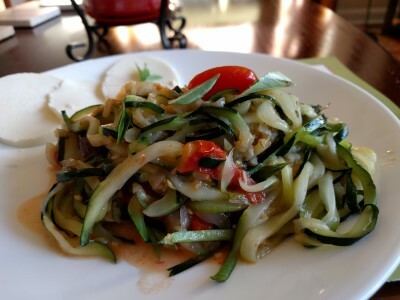 After everything is sauteed, it is tossed together and served. This is quick and easy and tasty. I like the mix of textures and flavors from the cooked and uncooked tomatoes, the salty olives, slightly crisp zucchini, soft eggplant, the acidity of that bit of lemon. 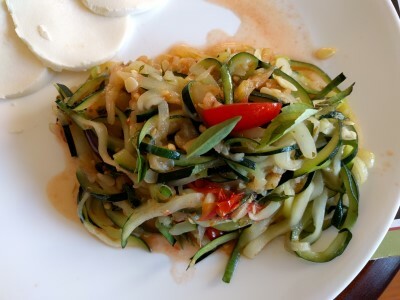 Spiralize zucchini and place in a strainer in the sink or set over a bowl. Sprinkle with 1 Tbsp. salt and toss to combine. Let sit 10 minutes then press gently to remove any liquid. 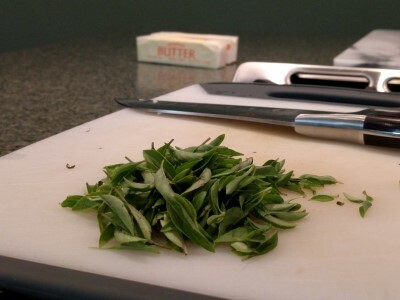 Whisk together lemon juice, honey, pepper, 1/2 cup basil, olive oil, and 1/4 tsp. salt in a large bowl. Heat some olive oil in a large skillet. 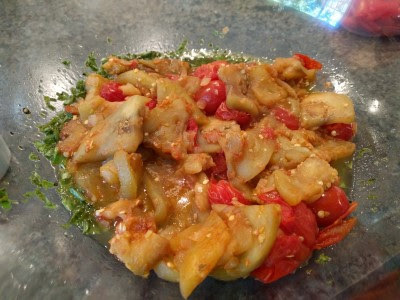 Cook onion, eggplant, and whole tomatoes until eggplant is browned and cooked through and tomatoes begin to burst. Transfer to bowl with dressing. Drizzle a little more olive oil in the skillet. Add zucchini and saute until slightly "wilted" and warmed. Add zucchini to bowl with eggplant & dressing. Add sliced tomatoes, kalamatas, and as much fresh basil as you like to the bowl. Gently toss everything together. Either alongside or on top the zucchini, serve as many slices of fresh mozzarella as you like.